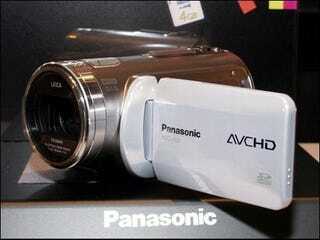 Panasonic is going high-def with its HDC-SD1 video camera. The cam uses a 3CCD sensor to record video in 1080i. Its packed with a 12x optical zoom Leica lens and records straight to its 4GB card (which will let you record roughly 40 minutes of video). The cam has everything you'd expect from an HD cam like HDMI, support for Dolby 5.1 recording, and a nice 3-inch LCD. We've yet to see the Panny in action, so we'll stick to our Sony SDR-HR1 for now, which may be chunkier, but has already proven itself capable. Like the Sony, the Panasonic can take high-quality stills while recording. It'll sell for about $1,500 bucks in December. More pics after the jump.